It is my turn to be the “feature dancer” and post something for all to read. This is a bit scary for me, but here it goes! I will try to make this personal, concrete and accessible for those who are new to the dance world. Taryn asked me to write about anything — I knew, inside, that I had to write about why I dance. Since I graduated from dance school 2.5 years ago, I have been very lucky to participate in many interesting projects. I haven’t had any prolonged breaks or times with nothing waiting for me around the next corner. More and more I can actually live/survive on the small pay from these dance contracts. Like most dancers, I also have a few part-time jobs (teaching yoga mostly) that help weave a thread of stability through the contractor life-style. This is all tickity-boo if life behaves, contracts keep appearing and nothing unexpected happens. We all know life doesn’t really work this way. This fall I was “doored” while biking to work in Montreal. Until just recently, a car must be in motion to be held accountable and since I was on my way to non-dance work, I couldn’t be covered. The woman in the car also gave me faulty info. yeah. I was pretty lucky and incurred only deep bruising to all my soft tissues in my right knee. However, the recovery still took one whole month of rest (no working) and physiotherapy (lots of money) which pitched my lovely barely balanced life into the red zone. Injury is something all dancers must learn to manage and I have had my share of twists, strains, stitches and displaced or cracked ribs etc. This fall was different because for quite a while I had been struggling to balance dance and a romantic partnership. Everything combined forced me into a profound identity crisis. Why was I choosing this life? Was there any actual good coming from all this ever consuming work? The amount of time and money I had invested in creation, production, training and injury prevention and care would be insane for most people. My crazy long hours, changing schedule, the constant search for the next contract and obsessing over my own creative dreams made me a rather challenging friend, girlfriend and sometimes employee. After all this, in dance, almost everything is ephemeral — it disappears. We work hours and hours to perform for audiences made up largely of other poor artists who are quick to criticize. Meanwhile, our bodies march relentlessly towards decay. It is only how I feel on my down days. — I’ve had a lot of down days this past little while. So why am I pursuing this crazy path? Well, I am not quite out of my identity crisis yet. Most of the time I don’t know what I am doing and feel like I couldn’t possibly have anything to say or express that is of any use or interest to anyone else. We had to improvise. The only rule was to do some of the movement sequences/ideas we had developed, which were written on small pieces of paper scattered around the space. Everything else was unknown. The five of us walked into the studio space and then something shifted. Something subtle, hard to explain, but it happened. It was as if we all entered another world. All five of us were listening to each other. We were like animals watching with eyes, ears and skin. We were deciding whether to face-off and attack, circle each other, separate into small groups or play like old friends. Who would break the silence? I could see Simon and Jenn and I could feel that Pam was behind me and Ralph was with her. Simon slowly moved and everyone relaxed. We decided, together, that this was a moment for sparseness. Jenn started walking across the space. I could sense someone close to me, walking behind me and then Pam was in my peripheral vision, close, just behind my right shoulder. We took a moment to acknowledge each other and then somehow we both sped up and made a big semi-circle side-by-side. Suddenly we both stopped. (I love these moments when we surprise each other) Our improvisation continued for the next 45min to weave a tale of relationships and events based on partnerships, alliances, rebellion, fear, exploration, team work, love, isolation, compassion, aggression, surprise, confusion, ugliness, beauty, connection, disconnection, and of course, consumption. During this improvisation Jenn handed me the end of a long roll of crinoline. I brought it close and then kept pulling it towards me, covering my mouth and then my whole face. I started to feel a sense of relief, of calmness I haven’t felt for so long. Someone came up to me and started wrapping the fabric all around my body. I realized it was Pam and she was telling me her story. Despite the wrapping of the fabric, I felt a freedom to move in reaction to Pam’s words. I couldn’t see and my breath was difficult through the tissue. I followed Pam’s voice and body as I danced. She sat me on a chair and I slowly let the fabric fall away. I could see everyone else and knew that they had allowed this moment to resonate in the studio. This means they let their own movement/story become more still, supporting my interaction with Pam and the fabric. This small act of generosity is what makes individual stories in an improvisation come to life. And this one in particular allowed a small piece of my identity crisis to slip away. The artists of inlayers are asking for your support by donating to our online fundraiser. Though the project is underway with the support from Alberta Foundation for the Arts, this funding only covers 25% of the budget. The rest is up to our own efforts. Your donations will go to help pay the 8 involved artists for their full time contributions, hard work, and dedication during the 6 weeks of this project as well as additional creation and production costs. Originally from Calgary, Alberta, where she completed a BA in dance, Melina Stinson is a contemporary dance artist currently based in Montreal. Since graduating from LADMMI l’ecole de danse contemporaine in May 2009, she has worked professionally with such companies as Carré des Lombes, Bouge de là, Manon fait de la danse, Human Playground, Woo Me Myth, Pulse and Puppet and most recently for Melanie Demers with “As Yet Untitled”. 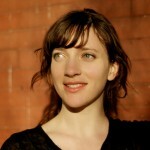 Stinson is passionate about creating her own choreography and often works in close collaboration with musicians. She has shown work at several events and festivals in both Montreal and Winnipeg. In 2008 Stinson cofounded AléAcréation, a contemporary dance company geared towards collaborative projects that bring together emerging and experienced artists.